Hello all! Remember me? I feel like I have been MIA lately. This past weekend we had the last three shows for the Homeschool Performing Arts production of Willy Wonka. But before I totally collapse, I thought I should share some more card samples with you. 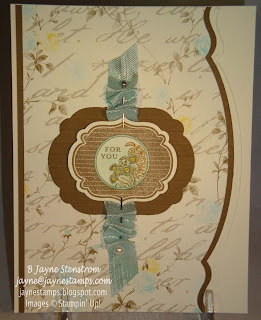 Have I mentioned how much I love the Apothecary Art stamp set in the Occasions Mini Catalog? I don't think I'm the only one either, judging by how many samples I've seen with this set. And I LOVE the fact that the images can be cut out and framed with our new Framelits Labels Collection Dies. So pretty! My friend Cindy W. made this first card. 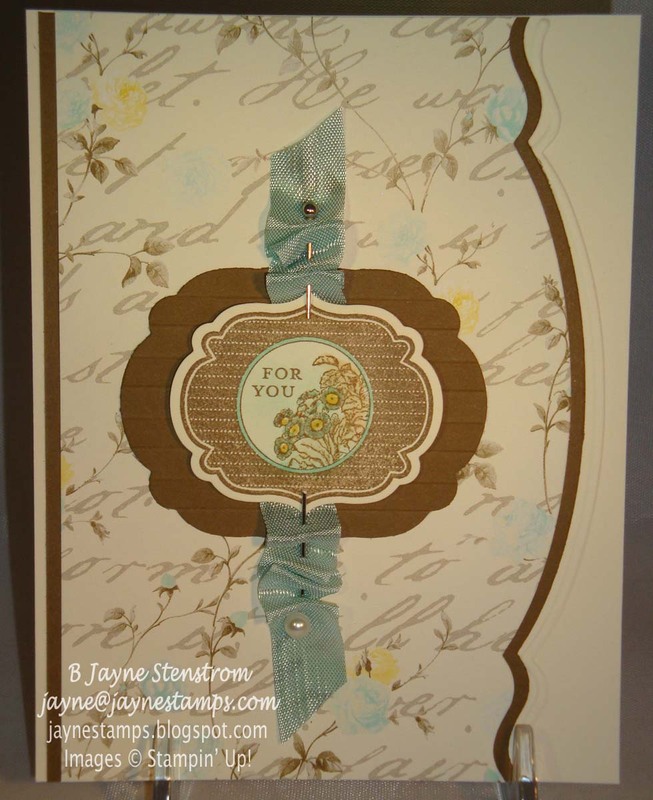 Besides the Apothecary Art stamp set and Labels Collection Framelits, she used the Attic Boutique DSP, Hat Pins (pg. 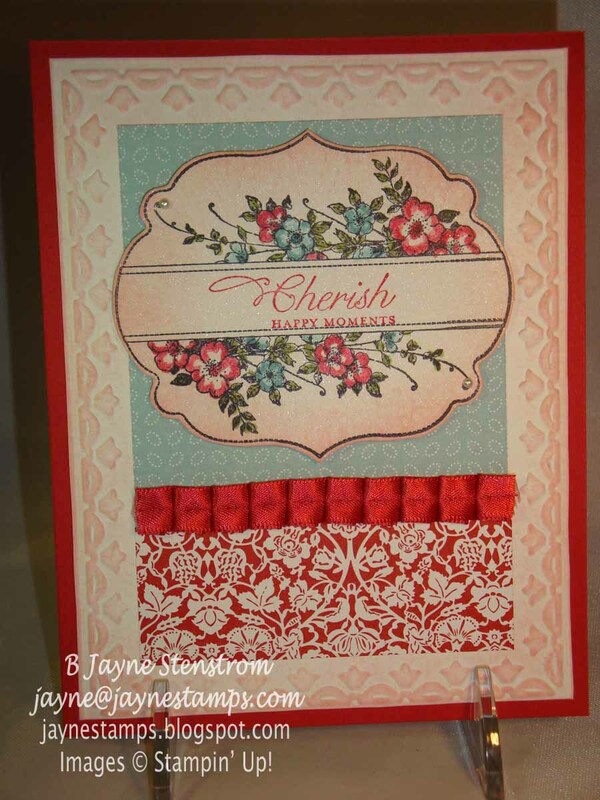 18 in the Occasions Mini), Adorning Accents Edgelits Dies, Pool Party 1/2" Seam Binding Ribbon, Stripes Embossing Folder, and Soft Suede and Very Vanilla card stocks. Isn't this card elegant? 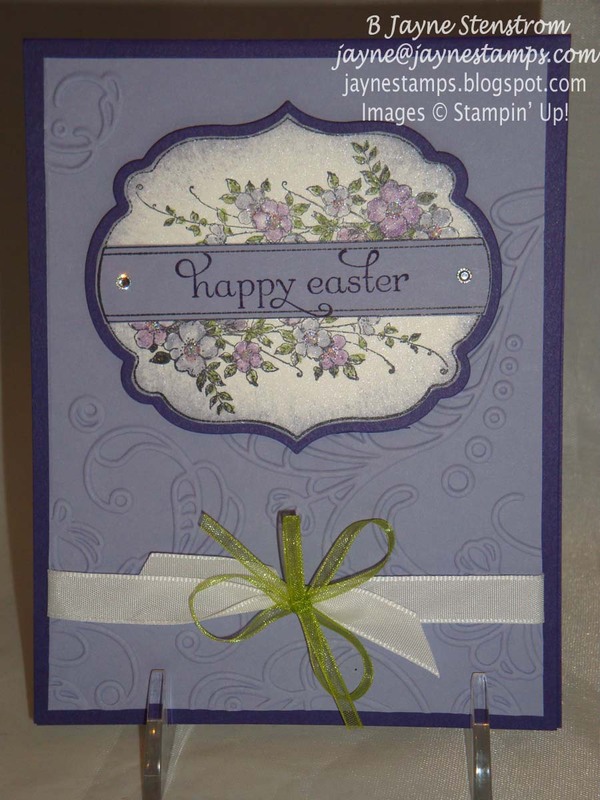 The next two cards I made for a couple of different swaps I'm in. Both use the same image from the Apothecary Art set, but they look totally different because of the colors used. They were both watercolored with Blender Pens and dye-based ink pads, which went very quickly. 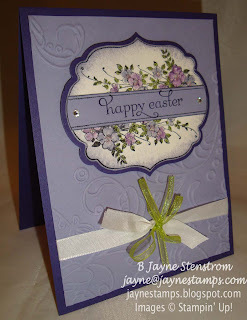 This purple card was one that I saw on another blog and I thought it was just SO pretty that I had to re-create it! 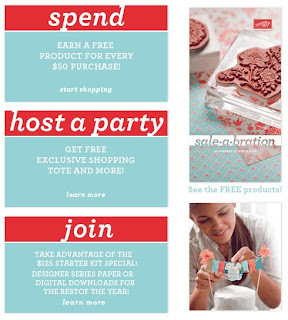 And don't forget that we're still in the middle of Sale-a-Bration!! You can contact me if you have any questions or would like to place an order.